Compared to other environmental issues, Russians consider water pollution to be the most serious. A view of Alexander Nevsky Cathedral at the confluence of the Oka and the Volga. 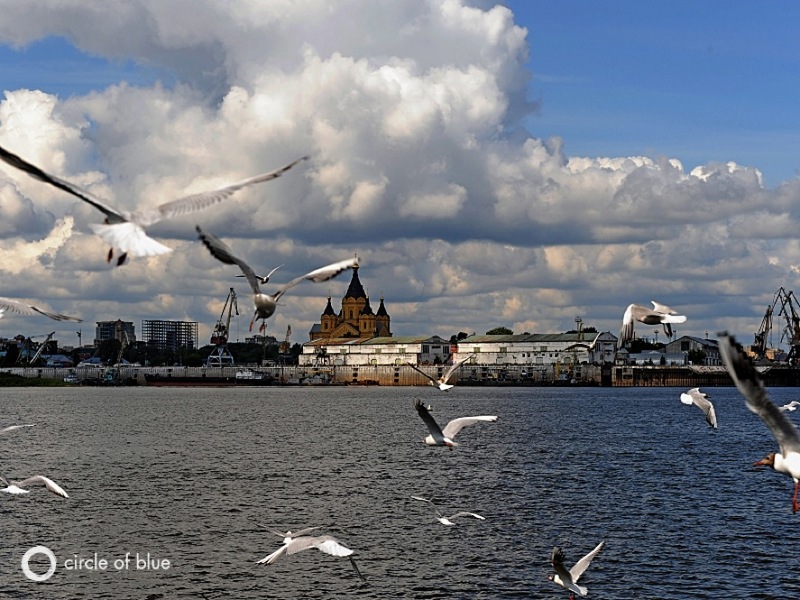 An integral part of the daily lives of its riparian cities, the Volga also lives -– majestic and proud -– in Russian poetry, music, literature, art and history. Photo © 2009 James Hill/Contact Press Images for Circle of Blue. Compared to other environmental issues, Russians consider water pollution to be the most serious. On specific water issues, this sentiment is echoed, as Russians are most concerned about water pollution. Russians do not feel empowered as individuals to address water problems, and two-thirds of them say they need more information to be able to help protect water. Russians hold the government the most responsible for community water supply but acknowledge that the solution to water problems likely needs to involve companies. When prompted on eight environmental issues, Russians consider water pollution to be the most serious. The seriousness of fresh water shortages follows close behind, along with the depletion of natural resources and air pollution. Ninety percent of Russians surveyed agree that it is important for all people to have adequate, affordable drinking water. Seventy-four percent worry that fresh water shortages will become an increasingly severe problem worldwide. Russians show the most concern for water pollution (57 percent are very concerned), and less concern for the lack of safe drinking water and the cost of water. Concern for lack of water for agriculture is lower (30 percent are very concerned) for Russians. When asked who should be held responsible for ensuring clean water in communities, a majority of Russians place primary responsibility on water companies (65 percent). Less than a majority places responsibility on both government (47 percent) and large companies (45 percent). Little responsibility is placed on NGOs. While less than a majority of Russians believes large companies should bear complete responsibility, they do believe that companies need to be a part of the solution (63 percent agree). Nearly all Russians (90 percent) agree that water shortages are such a big problem that there is little individuals can do. Sixty-five percent indicate they need more information before they would feel able to help protect water. The largest country in the world, Russia possesses one-third of the planet’s fresh water, second only to Brazil. Spanning the whole of northern Asia and 11 time zones, the country accommodates five main drainage basins, the world’s largest lake, Europe’s longest river, about two million fresh water and saltwater lakes and 10 million square kilometers of permafrost. Russia’s giant rivers, also called “little mothers,” weave and braid through the vastness of the Russian steppe, tundra and taiga in Europe and Asia. In remote southern Siberia, Lake Baikal – the world’s largest, deepest and oldest lake – contains 20 percent of the global fresh water and 80 percent of Russia’s fresh water. Although it is rich in water, much of Russia’s land lies at cold, inhospitable latitudes. In addition, its water and population are unevenly distributed. A large percent of the population and the country’s agricultural production is concentrated in the European part of the country, where the climate is warmer, but water is less abundant. Thirty-five to 60 percent of potable water, particularly in the more densely populated European Russia, does not meet sanitary requirements as a result of high industrialization and the legacy of the Soviet and transitional periods. The Amur and the Volga are the most heavily contaminated rivers. The Techa River in the southern Ural Mountains suffers from intense radioactive pollution. Existing water infrastructure is largely outdated, resulting in frequent breakdowns. About $459 billion is needed to complete the necessary upgrades and extensions of water and sanitation infrastructure in Russia by 2020, according to the World Bank. Yet, the abundance of Russia’s water, only 2 percent of which goes for domestic use, has prompted Viktor Danilov-Danilyan, the director of Russia’s Institute of Water Problems, to predict that water may replace oil and gas as Russia’s main source of revenue in the next 30 to 40 years.